A trigger point, also known as a muscle knot, is a hyper-irritable spot on the body that is painful. It is called a trigger point because it “triggers” a painful response. But a trigger point is more than a tender nodule. It affects not only the muscle where the trigger point is located, but also causes “referred pain” in local tissues supplied by nerves. Trigger points are located in a taut band of muscles fibers. Only a physical examination can determine if the symptoms, patterns of pain and signs are cause by a trigger point. If you have a trigger point diagnoses the therapist will locate and deactivate the painful areas using finger pressure. These points are often areas of chronic “holding” and you need to learn how to move in different ways to keep them from recurring. An accident can be the tipping point that will change a chronic mild discomfort into something unbearable. If you’ve never tried massage therapy for your whiplash symptoms, now is the time. Massage therapy has many benefits that can help you get your overall health and well-being back. 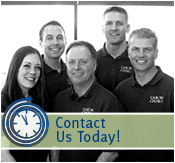 If you have any questions about massage therapy, call Caron Chiropractic Clinic at 651-255-9999 today. This entry was posted	on Friday, April 4th, 2014 at 5:06 pm	and is filed under Chiropractic Treatments, Massage Therapy, Whiplash. You can follow any responses to this entry through the RSS 2.0 feed. You can leave a response, or trackback from your own site.